A Totally New Kind Of Event Rental For Kids! We’ve invested months of development with a leading Canadian manufacturer to bring you the best children’s event rental in Canada – Sprog & Sprocket’s Portable Playground! We genuinely believe that parties and events are an opportunity for children to play, make friends, and create memories that will last for years to come. Whether it’s a child’s party, or a larger event that will be hosting little ones alongside the adults, our Portable Playgrounds provide hours of uninterrupted play in a fun and safe environment. Children unleash their imaginations while parents sit back, relax and enjoy the event too! With way more ways to play than a typical bounce house, our Portable Playgrounds are the perfect event rental to keep energetic children playing for hours! 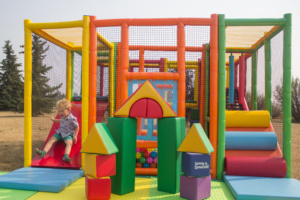 Why choose a Portable Playground for your next event? Set-up in approximately one hour! Finally an event rental that can work for children with slight to moderate physical limitations. A suitable alternative to busy indoor playgrounds for children with sensory processing disorders or children on the autism spectrum. Talk to us so we can help you assess the suitability for your event. No electricity required & No noisy blowers – the only noise you’ll hear is the sound of fun and laughter! Two Rental Options That Will Make Your Event Unforgettable! Sharing is caring – but not when it comes to germs! That’s why we clean all the ball pool balls between every party! birthdays, weddings, family reunions, christenings, baptisms, public functions, corporate events and business promotions! To create amazing memories at your next party or kid-friendly event call us on 403 719 7776 or use the reservation form below. If you’re planning a public or corporate event, please contact us for rates. Questions? Check our FAQ’s page or get in touch! Would you like to see more pictures? Just click on our Facebook or Instagram buttons at the page footer – more photos added daily!